The last week of December is upon us and you know what that means! Yes, yes, I know, it means quite a lot for many people (Christmas; Hannukah; Kwanzaa; New Years; birthdays – I’m talking about you, Melissa Hanna; mid year exams coming up, yikes; unfortunately you forgot to apply for leave in time and are now stuck manning the empty office; travel plans; disrupted transportation services…) but for me, specifically, it means time to clear my annual leave! And this year, I opted out of going away for a holiday with my friends and/or family. This year, my holiday plans revolve around my amazing kitchen, and that ever-growing list of recipes I’ve been dying to try out for the past few months. Forget New Years’ resolutions (who are we kidding, those never get done); 2014 I’m going to draw up a “To Bake” list and just keep working at it. Speaking of lists, I came across this fantastic journalling technique while browsing my nerd sites the other night! It’s a nifty method of tracking what you do and what needs to get done. I see the benefits in this method, and I’ll likely use it for my work journalling but for my personal journalling, I prefer the story telling method with poorly drawn illustrations. Do you guys keep a journal? Are you like me in that I’m completely obsessed with beautiful blank page (important to note the blank pages) notebooks? I personally find there’s nothing quite like writing your thoughts down on a Moleskin with a leaky fountain pen at the end of the day to truly be able to reflect on the day’s events and set it aside to start fresh the next day. Onto the chocolate filling: Chop the chocolate and place it in a medium sized bowl and set aside for a while. Heat the cream and butter in a saucepan until it comes to a boil, stirring occassionally to get the butter in there. Once it’s boiled, pour over the chocolate and let it sit for about a minute before stirring with a spoon until it turns into a smooth chocolate mix. Then beat the eggs in one at a time and hand-whisk lightly before pouring into the prepared crust. Do the same with the chocolate, cream, and butter as when making the filling above. However, add the light corn syrup to the cream and butter in the saucepan (this gives the ganache a shiny glaze). Allow the chocolate ganache to cool and thicken before spreading on top of the cooled tarts. 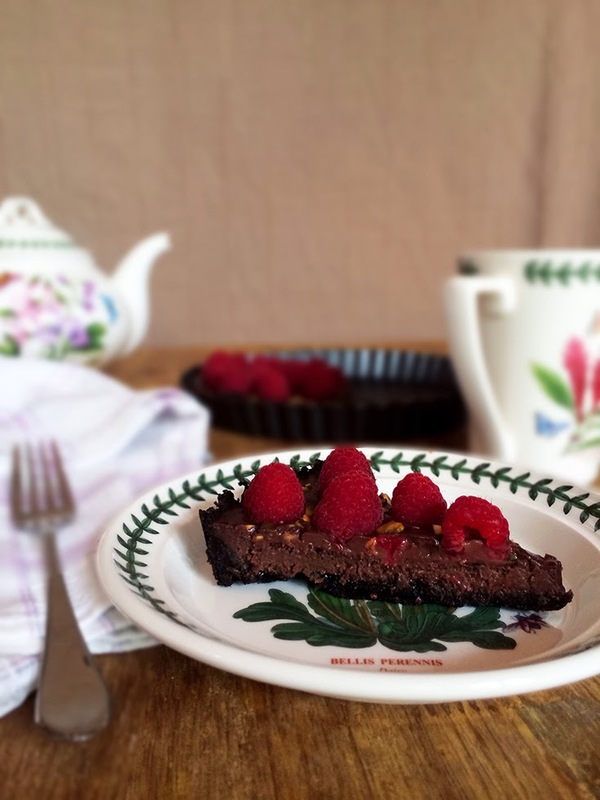 Decorate with crushed pistachio kernels and fresh raspberries. 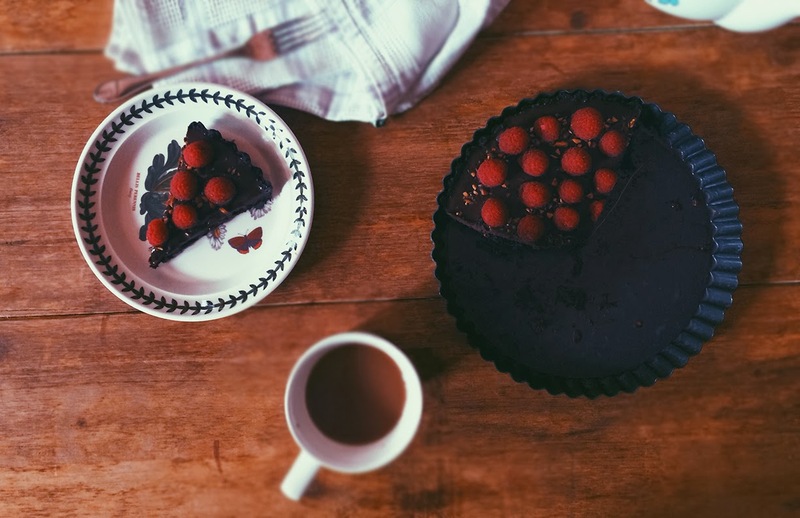 Set the tart in the fridge for up to 1 hour, then serve with a cup of gorgeous brewed coffee.